Today as we celebrate the men and women who have valiantly served this wonderful country, I wanted to highlight a particularly special group of veterans. 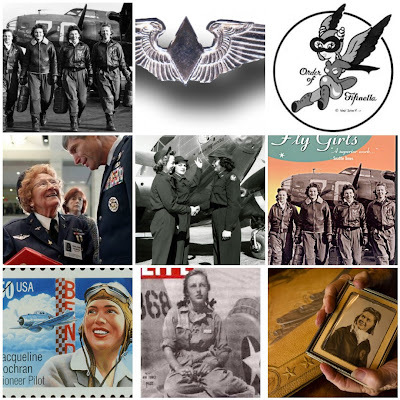 The Women Airforce Service Pilots, or WASPS as they were commonly called, were the first women in the United States who were trained to fly military aircraft. During World War II, these brave women flew every type of aircraft that their male counterparts flew except for combat. They are true pioneers who were forgotten for many years and are recently receiving the recognition that they deserve. What a role model for women! * 25,000 applied, 1,830 were accepted into training and only 1,074 earned their silver wings and, together with 28 WAFS, became WASP. * After they were disbanded in 1944, their records were sealed and marked 'classified' or 'secret' and stored in the archives for over 30 years. * Historians had no access to the records and accomplishments of the WASP...so, the WASP were left out of most official histories of WWII. "You either had a chance of doing it or go home. Those who wanted transfers went home! We did what we were assigned to do...with no regrets!" that you and I can't handle together." Happy Veteran's Day to the WASPS and all of the brave men and women who served our country.